Burlington Fine Arts Club, Exhibition of Early German Art, London, 1906, case A, no. 1, where it is stated that the base was applied with a third animal, a dog, which is now missing. 1913 Bath House Inventory, p. 134, no. 665, in the safe, describing the animals at the base as 'two hounds and a pig [crossed out and amended to boar]'. 1914 Wernher Inventory, p. 90, no. 447, describing the animals at the base as 'two hounds and a boar'. 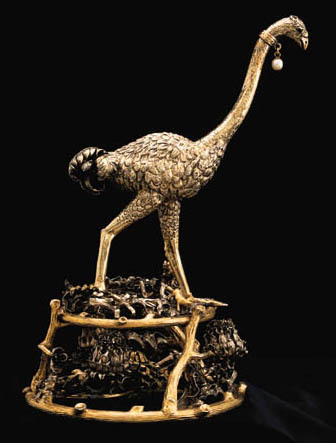 The model of the ostrich is similar to the support of a magnificent silver-gilt ostrich egg cup by Clement Kicklinger, Augsburg, circa 1570-75, now in the Kunsthistorisches Museum, Vienna (inv. no. 897) (illustrated in H. Seling, Die Kunst Der Augsburger Goldschmiede 1529-1868, Munich, 1980, III, fig. 100). A second cup of very similar form, and indeed perhaps based on the Vienna cup, formerly belonged to Frederic Spitzer and was sold as part of his collection in Paris in 1893 (lot 1708). While metal analysis of the flowers on the base of the present model show them to be made of metal consistent with sixteenth- and seventeenth-century silver, it is possible that the piece is largely nineteenth-century in date.